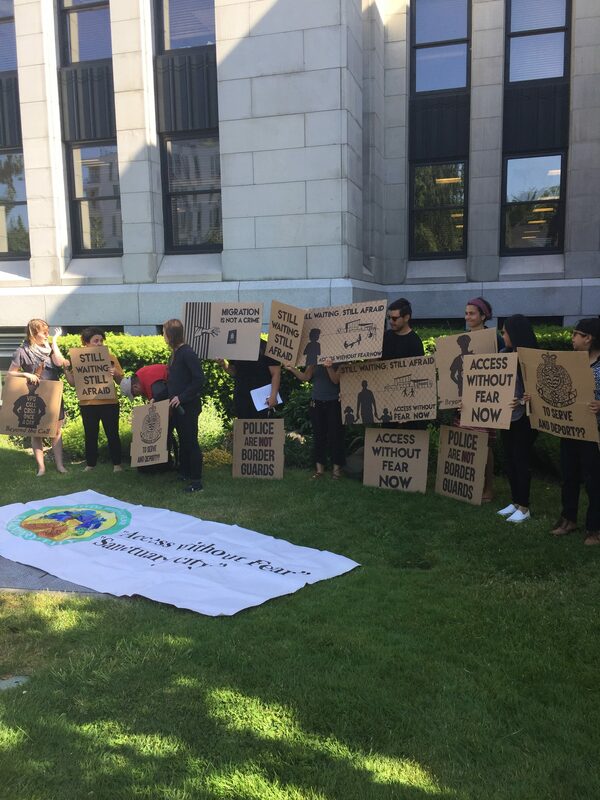 On the morning of Wednesday, May 23rd, grassroots migrant justice group Sanctuary Health presented the results of the Access Without Fear audit, which they conducted with a group of UBC students. The audit assesses the extent to which the City of Vancouver has actually implemented the Access Without Fear Policy that City Council unanimously approved of two years ago. Not surprisingly, the City’s empty policy has not led to any significant changes in how people with precarious or undocumented immigration status access city services. The policy, whose full name is “Access to City Services without Fear (ACSWF) for Residents with Uncertain or No Immigration Status,” states that its purpose is to address the fear that City staff will ask about immigration status, or share people’s immigration status to other public institutions or levels of government, unless required by law (staff are not legally required to share personal information of service users except through a court order or subpoena). The policy applies to Fire and Rescue services, Community Services including Street and Homeless Outreach, Utilities and Public Works, and Information services. The policy gestures at policies passed by American sanctuary cities that forbid city staff from sharing information with Immigration and Customs Enforcement unless required by law and direct municipal police to refrain from asking about immigration status. Toronto and Hamilton have also voted to call themselves “sanctuary cities,” albeit only in name—in 2016, No One Is Illegal revealed that Toronto police continue to help deport people, and the policy has received little follow-through in Hamilton. 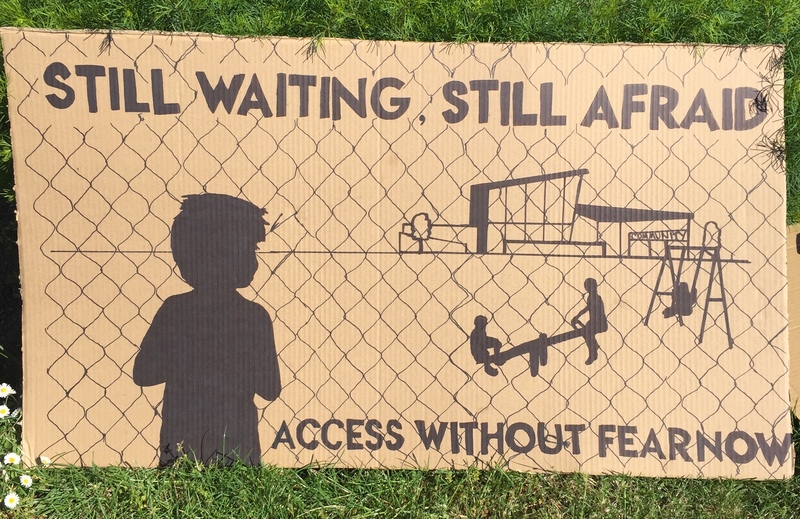 The audit, titled, “Still Waiting, Still Afraid,” finds that the City of Vancouver has done virtually nothing to implement the Access Without Fear policy. As a result, staff are unaware of the policy, the city has no way of evaluating it, and affected communities have not been included in developing guidelines. None of the frontline shelter workers surveyed had heard of the policy, and more disturbingly, a new agreement between the CBSA, John Howard Society, and the Salvation Army means that a new CBSA position, the “Community Liaison Officer,” will work directly with shelters. In addition, Belkin House will become a de-facto detention centre where the CBSA will monitor long-term detainees, as part of developing so-called “alternatives to detention”. The Vancouver Police Department continues to mobilize immigration status as a way to intimidate and harass visibly racialized, visibly working class migrants and refugees. The audit shares the story of a Latinx refugee in construction gear who was stopped by a VPD officer while walking down the street and asked for immigration papers, as well as a case when the VPD were called to a construction site to investigate missing tools, and instead asked for the immigration status of all the workers onsite. Byron Cruz of Sanctuary Health says that incidents like these are extremely common place. The most recent Access to Information Request states that from November 2014 to June 2015, the VPD made, on average, over 30 calls a month to the CBSA. Given their deceitful tactics and reliance on colonial and white supremacist violence to exert power, there is no reason to believe this number has decreased. The VPD’s empty adoption of the phrase “Access Without Fear” like the CBSA’s use of the term “clients” to describe the people they violently detain and torture, appropriates language as a public relations tactic. On a similar level, City governments that like to think of themselves as “progressive” or “multicultural” are more interested in the appearance of inclusivity than addressing the unjust violences people with precarious immigration status encounter day to day.